Schneider or Schneider Kreuznach is the popular abbreviated name of a manufacturer of industrial and photographic optics. When the company was founded at Bad Kreuznach in Germany on 18 January 1913 by Joseph Schneider, the name was Optische Anstalt Jos. Schneider & Co. In 1922 the name was changed to Jos. 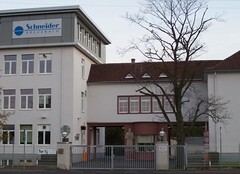 Schneider & Co., Optische Werke, Kreuznach, and in 1998 to the current Jos. Schneider Optische Werke GmbH. Over 14 million Schneider lenses have been sold worldwide. 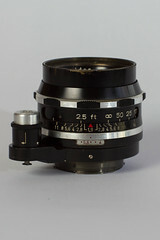 Schneider camera lenses are renowned for their quality and have equipped many luxury cameras to this day, including the recent Alpa 12WA and 12/SWA, Rollei 6006, and the Linhof Technorama panoramic camera. They continue to offer a full line of view camera lenses, including specialized ones for digital capture backs. 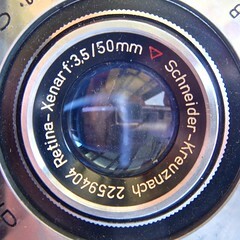 As lens supplier for Kodak and Samsung, Schneider is present in the mass market too. 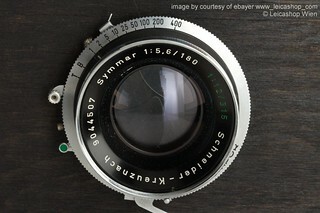 Schneider also makes lenses for repro cameras and for television cameras, as well as a range of industrial optics. Radionar lenses were assembled in the 1930s by the Japanese company Neumann & Heilemann, certainly from loose elements supplied by Schneider. See here for dating the serial numbers of Schneider lenses. This page was last edited on 4 December 2015, at 15:17.